That Moose Picked The Wrong Man To Fight With - ShareIt! This time, the moose had it coming, and that’s that, we understand that there will be some of you which will feel bad for the moose after the video but we think, that this guy did what he had to in order to protect himself and his kid. 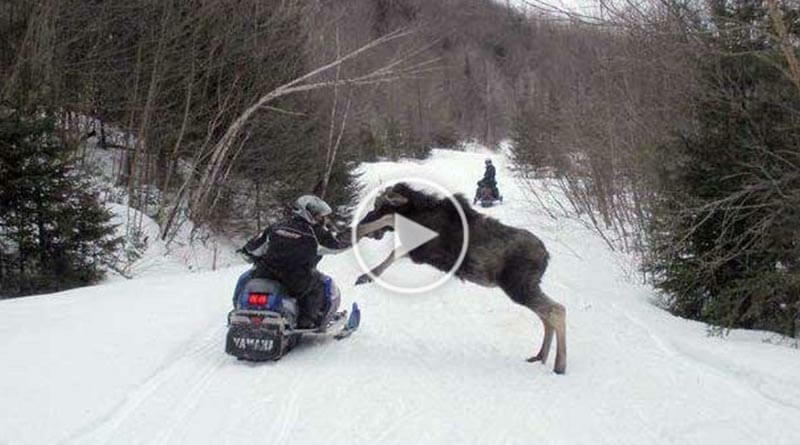 The video starts as a 51-year-old man which by the way, has a heart condition (dilated cardiomyopathy), stumbles upon a moose while snowmobiling, and he does what’s right, he tries to scare it away so they can both go about their business, but the wild animal driven by territorial instinct, attack the guy, and this is no laughing matter, a 1000 lbs wild animal can cause serious injury or even death. After managing to fend off one attack, the moose turns around and comes at him again, but this time, the father pulls his gun out. Now we love animals and nature as much as the next guy, but when it comes to a father protecting his son, sorry moose, but we would have done the same thing, and we are OK if PETA hates us for it! We know that some of you will differ with our opinion, and its ok to put that in the comment, but remember, to put yourself in his shoes, and answer us; would you let a wild animal endanger your son while armed?